Awesome. They designed the experiments, carried them out, draw conclusions, draw the figures with pencils (better than any commercial software, isn’t it ?) and wrote the paper. The paper was eventually published in Biology Letters, and is freely available here for now. The unique writing style is very refreshing. Just read it. Fascinating new option from Google for the search results. You can filter the search results by reading levels. They did this by analysing pages from Google Scholar and similar pages and comparing the statistical output to the other sites in Google’s index. Access this in Advanced Search>Reading Levels. A very helpful addition for academic research, help you filter a lot of the crap when doing some basic search on a new topic. You can also get some funny information’s by limiting the search to specific site. A few examples below. A long and interesting read in the Economist. A very and almost exclusively negative view of PhD and postdoc. PhD students and contract staff known as “postdocs”, described by one student as “the ugly underbelly of academia”, do much of the research these days. There is a glut of postdocs too. Of course they do much of the research ! This is what PhD’s are for ! How can you decide to get into research if you don’t experience it first ? With a tenure position, once you’ve taken care of grant writing, academic duties, teaching and various paperwork, your available time for research is usually deceptively low. Maybe materials science is very different from other domains, or it’s that we are very lucky in France, I don’t know, but my PhD experience was excellent. Pure research for three years, with a decent salary, and no responsibility other than carrying your own subject and writing your manuscript at the end. As for the postdoc, it was even better: already operational with the experimental techniques, no manuscript to write but papers, no responsibility again to write grants or any other paperwork, and with a great salary. A terrific time. Not mentioning that I was in one of the best materials science group in the world. Yahoo shuting down Delicious ? That would be a bad news. Delicious is a fabulous tool for academics, I’ve been using it to manage my bookmarks for years. Hopefully it will go open source. In the meantime, you can always export them into Firefox. have a student doing the work for you (lucky you). go to the library and check out the hardcopy. Less and less likely as most of the subscriptions are now electronic. 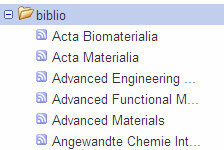 subscribe to the table of contents email alert for each journal. check out the journal’s website whenever you want to look for recently published papers. If you are reading anywhere from 10 to 30 journals, this can take a considerable amount of time. use a dedicated mobile app on your phone or IPad, like this one or that one. use RSS to be up to date with no effort, which I am going to explain right now. subscribe to a RSS service, the inbox for your feeds. There are plenty of them out there. Alternatively, you can use dedicated softwares or even use your email client. My favorite one is Google Reader, by far the most convenient, but your mileage may vary. click on the feed icon to add it to your RSS client, or copy/paste the feed address in your RSS client. that’s it ! Now when you fire up you RSS client, you will see a list of all your subscriptions, and every time that a new paper is published, it will show up automatically in your feed. I have something like 25 or 30 feeds, and all I have to do is to spend 5-10 min every morning looking for papers of interest for me. Whenever you click on a paper, you’ll be redirected to the journal website where you can grab a pdf for instance. In pretty much any RSS client, you can “star” an item which you are interested in. When I’m checking the new items every other day, I usually scan rapidly through the list of new papers, star the one which sound interesting from their title, and then review all the starred papers when I am done. Overall, RSS are probably the biggest time saver for me, and a terrific way of keeping updated with new papers as they are published. RSS is everything but dead for academics. There are plenty of other tricks with RSS for academics, but I’ll save that for another day. A useful addition. You can now search images in the ScienceDirect database. I can only hope the other publishers will adopt this idea. A nice and solid update overall. The new UI is much lighter than previously, feels much more responsive and is much less in the way. The other great improvement is the ability to add papers through Dropbox. Ideas for improvements: batch import through Dropbox, and the ability to define a “watched” folded, like Mendeley, to bring a little bit more of automation and make the sync a bit less tedious. A usefull overview if you are not familiar with the current solutions. And no, Endnote is not the only solution available nowadays. A must read, by Richard Hamming, back in 1986. Some obvious and yet underestimated attitudes, like keeping the door of your office open, changing the topics of your research regularly, and thinking seriously about the choice of the topics and their relative importance. See also for instance “How to choose a good scientific problem“. Intriguing new service from Springer showing who’s downloading what from Springer’s website. Not sure what to do with it, but interesting nonetheless. Majority of the activity is related to biology stuff, obviously. They clearly took some direct inspiration from Apple’s matrix-style app wall from WWDC 2009 for their icon wall.